The first commercial installation of our patent pending “Circle Slot Jets” (CSJs) was installed in a municipal Multiple Hearth Furnace. The CSJs significantly improve the capacity and efficiency of the furnace by improving convection in both the drying and combustion hearths. This leads to a better, cleaner, faster combustion process. 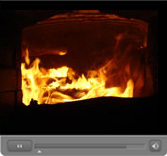 Without CSJs: Video of Furnace One without CSJs. 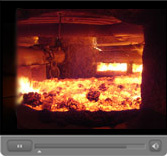 With CSJs: Video of Furnace Two WITH Circle Slot Jets: Notice the active fire bed.